Its Summer , traditionally the off season for AFL football . Silvers Circus , currently performing at Burnley , in Melbourne's inner east , have added a new part to their show , an act on juggling a football . Its called the Trick Star Freestyle show. As part of their live show , it highlights the spectacular new sport , of Freestyle Football, which is the art of juggling a football in any position , with various parts of the body , in time with the pumping soundtrack . Interesting , but do the performers wear their football jumpers , jerseys , guernseys whilst doing it ? Footy Jumpers at the Circus ? 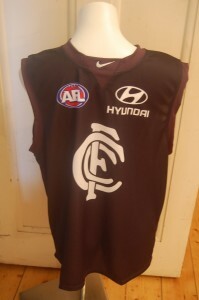 This entry was posted on Tuesday, November 23rd, 2010 at 8:40 am	and is filed under AFL, football jumpers, NRL. You can follow any responses to this entry through the RSS 2.0 feed. Both comments and pings are currently closed.